Since next Thursday is Thanksgiving, I am posting a recipe a week early and one that my mom contributed in honor of the holiday. I gave her my old digital camera so she can start taking photos of her food and emailing them to me 🙂 She staged this one with some holiday props! 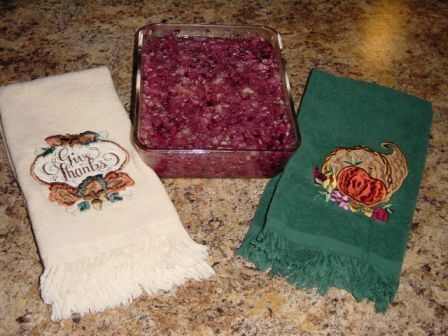 Process cranberries until coarsely ground. Cut orange into chunks and add to food processor. Pour fruit into large bowl and add sugar and pineapple. Cover bowl and allow to sit out overnight at room temperature. Chill. Stir relish before serving.